This report on cartilage degeneration studies the current as well as future prospects of the market globally. The stakeholders of this report include companies and intermediaries engaged in the manufacture and commercialization of various products as well as new entrants planning to enter this market. This report comprises an elaborate executive summary along with a market snapshot providing overall information of various segments and sub-segments considered within the scope of the study. This section also provides the overall information and data analysis of the global cartilage degeneration market with respect to the leading market segments based on major products, key applications, end-users, and geographies. The market for these segments has been extensively analyzed based on their utility, effectiveness, sales, and geographic presence. Market revenue in terms of US$ Mn and market volume in terms of units for the period from 2016 to 2024 along with the compound annual growth rate (CAGR %) from 2017 to 2025 are provided for all segments, considering 2016 as the base year. 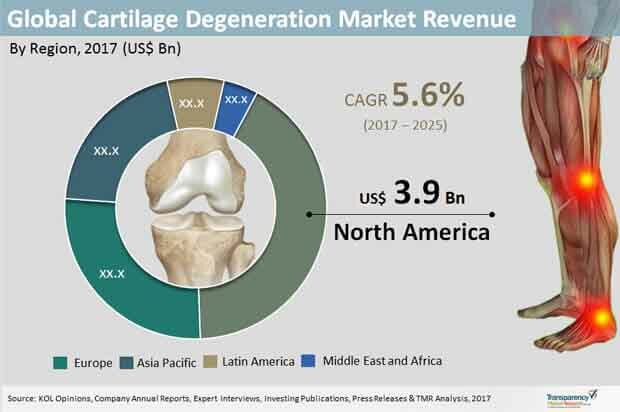 The market overview section of the report explores the market dynamics such as drivers, restraints, and opportunities that currently have a strong impact on the global cartilage degeneration market and could influence the market in the near future. Market attractiveness analysis has been provided in all the sections of the report in order to explain the intensity of competition in the market across different products/materials/end-users/geographies. The competitive scenario among different market players is evaluated through market share analysis in the competition landscape section of the report. The section also includes completion matrix that analyzes the competition among some of the top global players operating in the market. All these factors would help market players to take strategic decisions in order to strengthen their positions and expand their shares in the global market. The global cartilage degeneration market is classified in to procedure type, application, and treatment delivery channels. By procedure type the market is categorized as Joint Replacements, Chondroplasty, Osteochondral Transplants, Micro-Fracture, Meniscus Transplants, Cell based Cartilage Resurfacing, Autologus Chondrocyte Implantation (ACI), Others. By application the market is divided in to knee, hips & others. By treatment delivery channels the market is classified as Hospitals, Academic & Research Institutes, Specialty Clinics, Ambulatory Surgical Centers, Others. Geographically, the cartilage degeneration market has been segmented into five regions: North America, Europe, Asia Pacific, Europe, Middle East & Africa (MEA), and Latin America. Each regional market has been further categorized into major product, material, and end-user segments considered within the scope of the study. Key country (U.S., Japan, Germany, France, U.K., Australia, Canada, China, Brazil, Mexico, India, etc.) market revenues have also been provided in different regional sections within the report. Market revenue in terms of US$ Mn and volume in terms of units for the period from 2016 to 2025 along with CAGR % from 2016 to 2025 are provided for all the regions and nations considering 2016 as the base year. The report also profiles key players operating in the cartilage degeneration market based on various attributes such as company details, SWOT analysis, strategic overview, financials, and business overview. Major players profiled in this report include B. Braun Melsungen AG, DePuy Synthes, Smith & Nephew plc, Stryker Corporation, and Zimmer Biomet.